Aaron Bollinger came to Point Park from Florida State University where he was an assistant professor in the technical production graduate program. Bollinger has become a specialist in scenic automation, show control and digital media engineering for the stage. 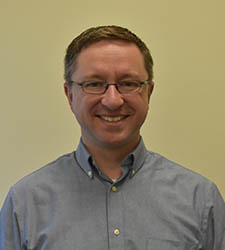 He is the current technical director for Pittsburgh Irish and Classical Theatre and teaches online AutoCAD classes at Florida State. Arts and Idea's Festival, video/media supervisor, New Haven, Conn.
"Automation 101 - How it Works, How it Fails," United States Institute for Theatre Technology, 2012. "Automation 101 - Terminology," United States Institute for Theatre Technology, 2010. "Digital Projections in Production 101," United States Institute for Theatre Technology, 2010. "Automation 101 - Brakes," United States Institute for Theatre Technology, 2009.